Mr Peter Hain (Neath) (Lab): But does not the Tories’ much trumpeted economic plan mean depressed earnings in Wales, generating lower taxes, and Government borrowing overshooting Labour’s planned target by more than £20 billion—the very deficit target luridly denounced by the Tories, who said it would bankrupt the country? Why does not the Minister apologise for this abysmal failure in the Government’s austerity strategy? Alun Cairns: As the right hon. Gentleman was part of the previous Government, he should apologise for leaving Wales the poorest part of the United Kingdom. He should further apologise for the fact that wages fell at the sharpest rate between 2008 and 2009. The Government’s long-term economic plan is working for Wales, and wages are rising quicker in Wales than across the rest of the United Kingdom. 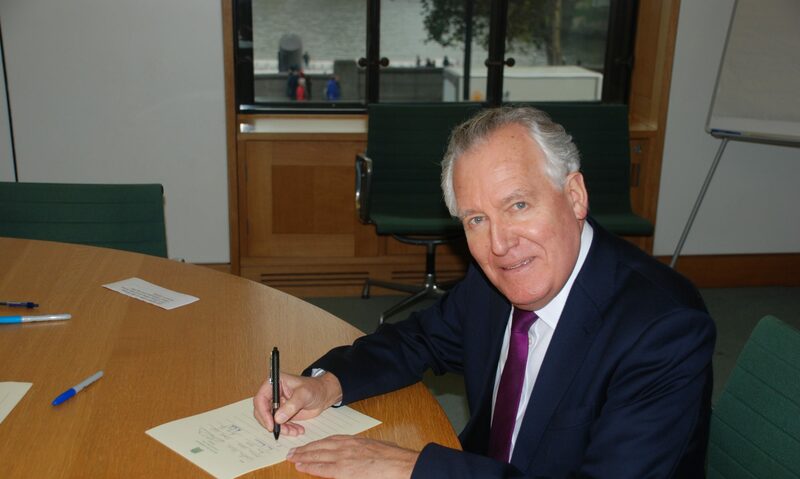 Mr Peter Hain (Neath) (Lab): I rarely agree with the hon. Member for Monmouth (David T. C. Davies), but I always get great entertainment from his sincere and intelligent extremism. He made a very thoughtful speech, for which he deserves credit, but may I correct him on one point about the national health service? I think he will find that more people cross the border from England to be treated in Welsh hospitals than go the other way. David T. C. Davies: That is true, but these people do not do that by choice; they have no choice, and many of them are actively campaigning to be treated back in England and do not want to be treated in Wales. Mr Hain: The facts seem to speak for themselves. We can have an argument about the degree to which people can express a preference, but the hon. Gentleman and his colleagues, led by the Secretary of State and the Prime Minister, persistently rant against the Welsh national health service as part of their war on Wales and completely distort the facts on the ground. Mr Hain: I will give way, although my speech is not about the Welsh NHS; I am merely responding to a point made by the hon. Member for Monmouth. Mr Harper: I was not going to respond, but I cannot let what the right hon. Gentleman just said stand. Thousands of my constituents live in England and passionately want to be treated by the English NHS, according to the rules and the rights they have in law, but because their GPs based in England are registered with the NHS in Wales they are forced to be treated in Wales according to the NHS rules. They do not like that prospect and I am doing my best to change it, so please do not pretend that they have run away from the English NHS by choice, because they absolutely have not. Mr Hain: In that case, I think the hon. Gentleman will find that the same applies for Welsh citizens on the Welsh side of the border. All I am saying is: let us have an intelligent debate about this, rather than rantings based on a misrepresentation of the facts on the ground. Let me get down to my speech. In focusing on clause 2 of the Bill, I wish to record my pride at taking the Government of Wales Act 2006 through Parliament as the then Secretary of State, not least because it provided for the full law-making powers the Welsh Government are now using to protect the people of Wales from this Government’s disastrous policies, including on tuition fees and on the creeping privatisation of the national health service, which is not being applied by the Welsh Government. The fact that the Conservative party, the only party in this House to vote against the 2006 Act, now seems to have accepted devolution is a sign of progress—I welcome that—but on the question of dual candidature it has sadly regressed. In section 7 of the 2006 Act, I amended one clause from the Government of Wales Act 1998 in order to prevent candidates from simultaneously standing both in a constituency and for a region, whether as a list candidate or as an individual—this Bill will disgracefully reverse that reform. Mr Hain: I am going to develop the point and then I will take an intervention. I want to remind colleagues of the reasons for the 2006 change. I did not act for politically partisan reasons, as was alleged by opponents of the change; I acted for democratic reasons. As one of the Ministers who also took the original 1998 Bill through the Commons permitting dual candidature, I never imagined for a moment then the abuses it would produce and the antipathy it would create among voters in Wales. Voters have never understood the widespread practice that has occurred since the Assembly was established in 1999, whereby candidates rejected by a particular constituency then secured back-door election as Assembly Members through the regional list and were even able to claim to represent the very constituency that had rejected them. Three of the four defeated candidates in Clwyd West in 2003 were subsequently elected to the Assembly through the regional list. Those very three people in Clwyd West—in the Secretary of State’s constituency—who were booted out by the electorate ended up as Assembly Members, competing against winning Assembly Member Alun Pugh. Alun Cairns: The right hon. Gentleman talked about the Welsh electorate’s antipathy to the arrangements. Will he remind us what the Electoral Commission’s view was, following its long consultation on whether or not there was a need to change policy? What advice did it give him as the then Secretary of State for Wales? Mr Hain: The Electoral Commission disagreed with me, and, not for the first time from my personal experience, it was wrong. Jonathan Edwards: Does the right hon. Gentleman recognise that the Labour party has also had candidates that stand on the list and in constituencies? In 2003, on the North Wales regional list, Sandy Mewies Lesley Griffiths, Carl Sergeant and Karen Sinclair stood both in constituencies and in the region. In South Wales Central, Rhodri Morgan, Lorraine Barnett, Sue Essex, Jane Davidson, Jane Hutt and Leighton Andrews stood in both the region and the constituencies, and in Mid and West Wales, Christine Gwyther stood in both. Mr Hain: Yes, indeed. That is my exact point. I am not making a politically partisan point; I am making a democratic point. The practice clouded political accountability and denied voters their right to reject a particular candidate at the ballot box. A change made by the Government of Wales Act 2006 requiring candidates to choose whether to stand for a constituency or on the regional list put the voters back in charge. It cannot be right for losers to become winners through the back door, despite having been rejected by voters. That is an abuse of democracy. Simon Hart (Carmarthen West and South Pembrokeshire) (Con): Surely the rejection is of the party in question. The system is there to get a little bit of equality across the parties. It is not about the individuals. Mr Hain: That intervention interests me. Is the hon. Gentleman saying that whoever stands for whichever party, even if they are deeply opposed by the particular constituents whom they seek to represent, cannot be challenged because they are standing on a party label? Chris Bryant: Is not the point also that Wales is not the only place in the world that has a top-up system to enable diversity within the legislature, but it will be the only place in the world where that practice of standing both on the list and for the first-past-post seat is used? Mr Hain: I bow to my hon. Friend’s superior experience and knowledge. I think that the system applies in Scotland. Chris Bryant: It does in Scotland, but I mean outside the United Kingdom. Mr Hain: It may well be the case that it exists outside the United Kingdom. Mr David Jones: I am grateful to the right hon. Gentleman for giving way. The hon. Member for Rhondda (Chris Bryant) is entirely wrong. Is it not the case that Wales is the only country in the world where, under this electoral system, dual candidacy is presently banned? Mr Hain: I am not sure about that, but what I can say is that we should look at the experience in Wales. If there is no such bar in other countries, then perhaps there was no such abuse there. There was widespread abuse in Wales, practised by 15 of the 20 list Assembly Members who used taxpayers’ money to open constituency offices in the very seats in which they were defeated. They then used those resources to try to win at the following election by cherry-picking local issues against the constituency AMs who had beaten them. That is the point. There is an honourable, constitutional and necessary role to be played by list Assembly Members across the whole region that they represent. There is no justification for seeking to abuse the system by getting involved in local constituency matters to try to win back a seat at the following election using that position and that resource. That is the fundamental point. Guto Bebb (Aberconwy) (Con): Will the right hon. Gentleman give way? Mr Hain: Not for a moment, no. The Government of Wales Act 2006 put the voters back in charge. If they did not want to elect somebody, they did not have to do so. The Act stopped the prevailing situation before then in which Assembly candidates could decide to place a “both ways” bet, by standing in both categories in order to win, even if they were kicked out by the electorate. To his shame, the Secretary of State is seeking to reintroduce that both ways bet. There was an unholy coalition of Conservatives, nationalists and Liberal Democrats opposed to abolishing that abuse. Now they have reincarnated that unholy coalition in defiance of the popular will. Why are they so afraid of taking their choice to the people? Why are they so afraid of losing constituency elections that they need the lifebelt of standing on the lists as well? Mr Hain: Perhaps the hon. Gentleman can answer that question. Guto Bebb: It is the case that the Welsh system of electing Members to the Assembly is replicated in many parts of the world, but the only country that has a similar ban is Ukraine. The Bevan Foundation, a Labour party think tank, is of the view that the ban should be withdrawn. That is not me, a former Secretary of State who banned the abuse, speaking, but Lord Richard who carried through an eminent report. That is a right that the Government, supported by Conservatives and members of other parties in Wales, are seeking to deny the electorate. That is not democratically defensible. Mr Harper: I am listening to the right hon. Gentleman’s argument, but I do not follow it at all. When we get a ballot paper in a first-past-the-post election, we have to choose a candidate—we have to vote for somebody. There is no option to say I do not like this person and to cast an anti-vote. I do not follow the idea that someone can vote against someone. They are choosing to vote for who they want to represent them in the Assembly or in Parliament. I do not follow the argument. Mr Hain: I do not know what happens in the Forest of Dean, but in every other constituency if a candidate loses, they lose. If the electorate rejects them, if the voters vote against them, they lose. They do not find themselves parachuted back in to the Assembly, from which the voters have barred them, via another route. Mrs Gillan: It was the right hon. Gentleman and I who sparred across the Dispatch Box on that very subject. I think he has a selective memory when it comes to the Richard commission. As I recall it, Lord Richard not only objected to the list system, but recommended that there should be 80 AMs and that Wales should move to that system and employ the single transferable vote, neither of which the right hon. Gentleman chose to take up. That is almost proof that the direction in which he took it was indeed partisan. Mr Hain: Wait a minute, Madam Deputy Speaker. Far be it from me to question whether the right hon. Lady was in order with that point, but the questions about numbers of Assembly Members and a proportional representation system are not within this Bill. They have nothing to do with this Bill. What is in this Bill is restoring the ban on the abuse of dual candidature which was in the 2006 Act, and it is that point that I am addressing. “may have a smaller pool of high quality candidates”. Mr Hain: I could not possibly comment, but since the Government say that, perhaps it is true on this occasion. A Liberal Democrat, a former Labour Member and a Conservative former Secretary of State all agree with me. I think that that helps my case. I recall, as Secretary of State for Wales, receiving on 9 January 2006 a press release from Helen Mary Jones, in which she described herself as a Llanelli-based Assembly Member, although she was on the list. In it, she complained about money being spent on a hospital in Carmarthen instead of one in Llanelli. However, as the list Assembly Member for Mid and West Wales, she represented both towns and should really have been supporting both hospitals. Had she been discharging her list Member’s duties properly, she would not have discriminated between the two towns or their hospitals. Owen Smith: Why did she? Mr Hain: Indeed, why did she? Why, of all the parts of the list area that she represented, did she target the one place where she had only been very narrowly defeated in 2003, invariably describing herself as the Llanelli-based Assembly Member? As it happens, I admire Helen Mary Jones for her ability and commitment, although not for her belief in an independent Wales. The 2006 Act stopped her describing herself as the Assembly Member for Llanelli, because there was one and it was not her. In the meantime, she campaigned hard and won the seat back in 2007. The list Assembly Member for South West Wales, Bethan Jenkins, is often described as the Neath-based Assembly Member and is more active in the Neath constituency than anywhere else in the region. She has not yet had the courage to stand in the Neath constituency, but if the Bill goes through with clause 2 remaining within it, perhaps she will do so, safe in the knowledge that being defeated in Neath will not prevent her from being elected—[Interruption.] I will not respond to that intervention from the hon. Member for Carmarthen East and Dinefwr (Jonathan Edwards). In a leaked memorandum written in August 2003, a Plaid Cymru list Assembly Member—now the party’s engaging young party leader—Leanne Wood, was embarrassingly blatant in encouraging abuse of the system using taxpayers’ money. Let me quote from that memorandum for the benefit of the House and my case. She urged Plaid Cymru Assembly list Members to concentrate tens of thousands of pounds of their local Assembly office budgets in their party’s target seats. She urged her party’s list Members to do casework only where it might benefit Plaid Cymru in those target seats and to attend civic or other events the constituency only if they thought they were votes in it. I could not have presented my case better than she revealingly did. Huw Irranca-Davies (Ogmore) (Lab): I am absolutely astonished at what I am hearing from my right hon. Friend. Would he, like me, welcome an intervention from the two Plaid Cymru Members present in the Chamber to distance themselves from that startling abuse of taxpayers’ money? Mr Hain: That is not a matter for me, but I take my hon. Friend’s point with acclamation. Wayne David: Is not my right hon. Friend’s case substantially weakened by the fact that nobody seriously believes that Leanne Wood can be party leader for much longer? Mr Hain: I think I shall move on from that point, despite the great respect I have for my hon. Friend. All the arguments and evidence I have cited demonstrate conclusively that the ban was not partisan but enhanced democratic standards among Welsh Assembly Members. Indeed, I reminded the House that six Labour Assembly Members, including three Ministers, could have been defeated in the 2007 Assembly elections by a swing of 3% against them—a very small swing. They would no longer enjoy the safety net of the regional list and two subsequently lost. The reform affected Labour candidates, just as it applied to candidates from other parties. Mr Hain: I think I really ought to conclude my remarks. Those are some of the reasons why I introduced the bar on dual candidature. It is astonishing that, for narrow partisan party reasons, the Secretary of State is assisting his own party members in Wales and those of other parties who complained about the ban. After the 2006 Act banned dual candidature, the well-known democratic abuses that had occurred before were not repeated. I find it astonishing that the Secretary of State is reinstating a regime that brought democracy in Wales into such popular disrepute. If he persists, I hope the House of Lords will delete clause 2. I want to pick up on an earlier point relating to the interesting exchange I had with the Secretary of State. I will read the exchange in Hansard carefully. I was not at all convinced by his answer. Indeed, I remain very concerned, on the question of income tax devolution, that Wales will be cut adrift from richer parts of the United Kingdom and lose out. There have been a lot of warm words about indexation, but I do not find the answers we have been given, or the references in the associated financial documents, to be at all compelling or convincing. I respect the Holtham commission and I respect Gerald Holtham. I understand his points on indexation, but I do not trust a Conservative-led Treasury to honour the commitments in the Holtham commission. I would be more reassured—this is a cross-party point, because we all want to see Wales doing the best it can—if a clear and absolute commitment was embedded in the proposed legislation for Wales to continue to benefit, regardless of income tax devolution, from the wealth of the United Kingdom. My politics come from a belief in fairness, and the redistribution from richer to poorer regions and from richer to poorer individuals. I do not see how tax accountability, which the Secretary of State exalts, can be a two-way bet. I do not see how having devolved income tax and giving, in the main, the Assembly greater accountability to local voters, will then be protected, according to the Secretary of State’s reassurance, by a kind of indexation that undermines that accountability. That makes me even more suspicious of it. I will be extremely sceptical of, if not opposed to, income tax devolution until I am absolutely sure that Wales will not lose out, for the reasons I have described. Mr Peter Hain (Neath) (Lab): I agree with the hon. Member for Cardiff North (Jonathan Evans) over Tata, but the one thing that cannot be said about the economy under this Chancellor is that it has recovered quickly from the shock of the global financial crisis. Total output still has not reached pre-crisis 2008 levels, quite unlike in the USA and Germany both of which passed their 2008 peak back in 2011. What took them three years to achieve is taking the British economy under this Chancellor six years, and the reason is the savage cuts since 2010, a far tighter squeeze than in the USA or the eurozone. Under Labour, recovery was already well under way in the first half of 2010 when the Chancellor came into office. It was his policies that choked it off and the British people have been paying a heavy price ever since. A second factor making the situation unsustainable is that UK productivity has been flat for years. This pushes up unit costs and keeps our export prices higher. Our export predicament is dire. On top of that, we are witnessing a housing bubble again, with property prices rocketing in London in particular. In short, nothing fundamental has changed to avoid a rerun of a financial crisis brought on by a debt-financed consumer boom and a Government-backed housing bubble that sooner or later will burst, because bubbles always do burst. Yes, the economy is recovering faster than forecast last year, but growth is forecast to be slower next year than this. The Chancellor expects the economy to run out of steam almost as soon as it starts to grow again, yet there is plenty of scope for much faster growth, and faster growth would mean less need for spending cuts and a quicker reduction in the Budget deficit. Robert Flello: It is amazing to hear the laughter from the Government Benches. Does my right hon. Friend recall, as I do, Conservatives standing up time and again saying there was far too much regulation of the banks and that they needed to reduce it? It was not Labour’s public spending that triggered Britain’s or the world’s economic crisis; it was the global inter-dependency of reckless banking that the Conservatives wanted to be less regulated that in 2008 triggered an economic meltdown in Britain and right across the globe. [Interruption.] Labour responded by boosting public spending and borrowing to offset the catastrophic collapse in private sector spending, and the £90 billion spent on bank bail-outs plunged the public sector into record annual deficits, but these were deficits that stopped a shocking slide into a fatal slump and laid the basis for recovery from the biggest shock to hit the world economy in peacetime since the 1930s great depression. [Hon. Members: “Give way.”] If I have time at the end, I will. Contrary to right-wing free market mantras and Tory-Lib Dem history rewrites, it was the banking crisis that caused debt to rocket, the deficit to rise and borrowing to rise as well. The low yields on UK Government bonds before, during and after the credit crunch under Labour bore eloquent testimony to the fact that the international markets had full confidence in its policies, and that they were not clamouring for the right-wing dogma subsequently visited upon Britain. Indeed, so desperate was the right hon. Member for Witney (Mr Cameron) to identify with Labour’s success on spending, investment, jobs and growth that he pledged to match Labour’s spending plans for three further years in September 2007 up to 2010. [Interruption.] Members on the Government Benches shake their heads, but that is what he did. If we had spent too much—if all the charges made by the Conservatives were true—why on earth would the current Prime Minister have backed our spending plans for three years ahead? It would help the quality of this debate and the quality of assessment of the Chancellor’s Budget if the Conservatives and the Liberal Democrats had the decency to acknowledge that essential fact, including this Prime Minister’s support for our spending programmes, instead of ploughing on regardless, with no end to austerity in sight. Mr Redwood: Why did the new and very expensive and complicated regulators the Labour Government introduced fail to control the banks when people like me were telling them they did not have enough cash for capital? Madam Deputy Speaker (Mrs Eleanor Laing): Order. All other speakers have been heard in silence. The right hon. Gentleman has livened up the debate, but he also ought to be heard. Mr Hain: It is interesting how those on the Government Benches do not like to hear the truth, Madam Deputy Speaker. The level of debt under the Labour Government before the banking crisis was lower than we inherited from the Conservatives in 1997. We brought borrowing down and we brought the deficit down compared with what we inherited, and yes we invested in repairing the desperate state of our public services—people dying on trolleys in hospitals, schools crumbling, the railways decaying. We repaired all of that and then the banking crisis came along and blew it out of the water, and there was a failure by every Government right across the world to recognise the seeds of that banking crisis, but it was not caused by Labour overspending, and not caused by Labour high borrowing or high debt, because none of those things was going on prior to the banking crisis, and if we had not dealt with the banking crisis in the way that we did, the whole of the economic and banking system in Britain would have collapsed. We need the decency and honesty from the Government Benches to acknowledge that central fact. Cosy texts between Ed and Vince. Lib Dem-hating Tory backbenchers who tell their Labour Oppo’s they have already written off the next election. Public antipathy to being sold a pup by the Government that austerity is working when it palpably isn’t. Does all this mean politics is shifting to a Labour win next time? Although conventional wisdom says it’s too big an ask for Ed Miliband to lead Labour to victory in 2015 after such a terrible defeat just five years before, new times defy electoral orthodoxy. The Tories took office without winning on a historically low base for a governing party. Their vote inched up painfully slowly from a low of 30.7 per cent in 1997 to 31.7 per cent in 2001, then to 32.4 per cent in 2005 Ω and finally to just 36.1 per cent in 2010.